Dry stone is the name given to a traditional type of popular architecture in which the stone is used dry, that is to say, without any kind of mortar, plaster or binding material between the different pieces. In this type of architecture the pieces are held together by their own weight, so that they present very diverse types of construction. Dry stone construction is a simple and relatively rapid method, based on local materials, often stones dug out from the cultivated fields themselves, and was done fundamentally by hand. This led to a rational use of the resources in each territory and its integration in the landscape. Dry stone is one of the main structural elements in rural landscapes in Catalonia, in the Mediterranean basin, and also in many other corners of the planet. It is testimony to an ancestral human activity which has modelled - and does model – a specific type of landscape: the dry stone landscape. Dry stone landscapes in general and dry stone architecture in particular are vested everywhere with aesthetic, historic, symbolic and ecological values which go far beyond their original practical function. The heritage of dry stone has been reduced in recent decades by the progressive abandonment of agriculture and livestock farming and the modernisation of the sector, which finds that the traditional terraces are no longer suited to mechanised production. 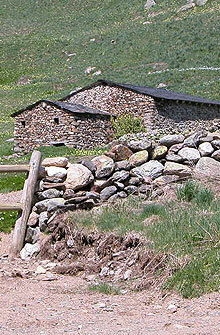 First, to disseminate the existence of dry stone landscapes and their diversity. To disseminate initiatives, entities and works on the subject of dry stone in Catalonia. To collect, classify, organise and bring to the public the principal information on dry stone in the world available on the Internet, including entities, institutions and regulations related with the subject. To become a point of reference on the subject of dry stone for specialists and for the public in general. It must be noted that the dossier only includes those institutions, centres and initiatives which have an active web. Unfortunately, this criterion in inevitably excludes other information of great interest on the subject of dry stone, but which cannot be consulted from the web.